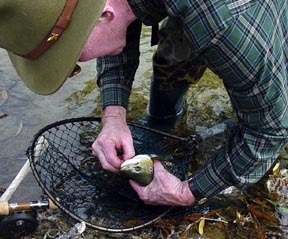 Harvey Maguire is a professional trout fishing guide in the Queenstown region, and I booked a day of his services. Right on schedule, he picked me up at the hotel at 8:00 this morning. We first went to a bakery to buy some sandwiches for lunch, and then to his house to pick up some fishing gear. He has a nice place, about 10 miles outside of town in the hills. He has 11 sheep ("lawn mowers"), a Springer Spaniel and 3 cats. We then headed south from Queenstown about 60 Km to the headwaters of the Mataura River where it flows through sheep pasture land, ending up at the coast way down at the southeast corner of the South Island. The water was clear and cold, and there were sheep everywhere. The stream has regular riffles and pools, and is lined with willow trees and gorse (very spiny stuff). The brown stuff on the stream bank at the left is Gorse. Imported from Scotland, it truly is nasty stuff--especially to fly fisher folk. If you look over the banks at any spot, this is what you see--sheep, sheep, and more sheep! We walked the stream banks until a trout was spotted, and then I cast dry flies for it. It was fun. 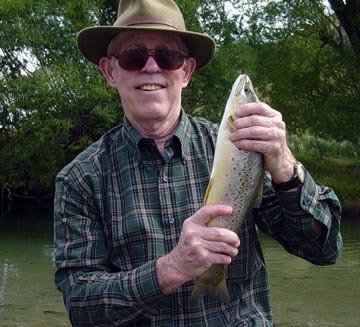 All told, I hooked four brown trout, and landed three of them. They were between 16 and 18 inches long, with the largest weighing something like 3 lbs. 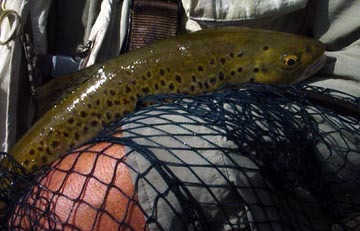 They were the largest wild trout that I've ever caught. These were the first trout we caught.  They are handsome fish, and put up quite a struggle in the cold water. All the trout were released. Harvey is a real nice guy, and is pretty astute about things. He is up on American politics, and wanted to know Ms. Clinton's chances in the upcoming election. He also was curious about the state of energy conservation efforts in the U.S.--hybrid cars, wind power, hydrogen fuel, etc. He is down on New Zealand bureaucracy, especially with respect to fisheries regulations. Here he chooses a fly for my line. The best fly of the day was an imitation of a blow fly, with iridescent mylar body. 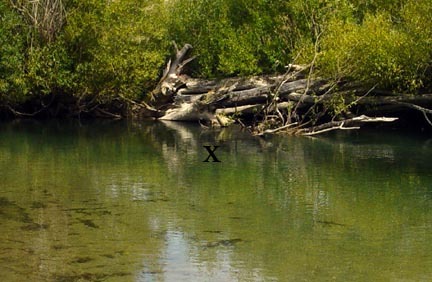 The final trout of the day was caught in this pool, rising to the fly where the "X" is. It had ignored offerings of three or four fly patterns, but went after the blow fly without hesitation. And here is the fish. Another fine day for weather in New Zealand, and a great day of fishing!